We recommend checking out our discussion threads on the HP Z640 Series P0C92UT Minitower Workstation P0C92UT#ABA, which address similar problems with connecting and setting up PC Workstations HP. The user manual for the HP Z640 Series P0C92UT Minitower Workstation P0C92UT#ABA provides necessary instructions for the proper use of the product Computers & Solutions - Desktops & Workstations - PC Workstations. The Z640 Series P0C92UT Minitower Workstation from HP delivers powerful performance in a 4U rackable minitower form factor and is designed for professionals who require high reliability. 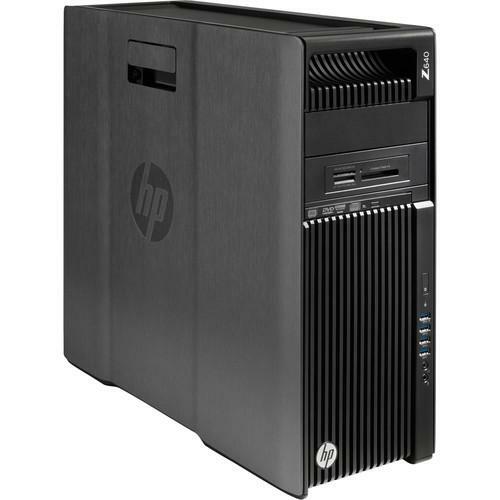 This model of the HP Z640 series of workstations does not come with a graphics card, which allows you to customize it with your own. Once a dedicated GPU is installed, the Z640 is designed for professionals who require high reliability and is well suited for tasks such as intensive graphics, 3D rendering, multimedia, and gaming, as well as science and engineering applications. The system is powered by a 3.5 GHz Intel Xeon E5-1650 v3 Six-Core processor which will allow you to run multiple applications simultaneously. If you need more power, the CPU can deliver extra performance by increasing the clock speed up to 3.8 GHz utilizing Intel's Turbo Boost 2.0 technology. The 16GB of 2133 MHz PC4-17000 DDR4 ECC Registered RAM allows the computer to run multiple applications simultaneously and also to access frequently-used files and programs. The current memory configuration is one 8GB module with an additional three slots available for memory upgrades, making for a total of four DIMM slots. With all four DIMM slots in use, this system supports 128GB RAM, or 32GB per slot. As this RAM features ECC technology, it is able to help detect and correct the most common kinds of internal data corruption. This RAM is also registered and registered memory modules, also known as buffered memory modules, place less electrical loads on the memory controller and allow single systems to remain stable with more memory modules than they would have otherwise. For long term storage of your files, a 256GB Z Turbo Drive G2 PCIe SSD offers quick access to your data. The M.2 half-height, half-length (HHHL) form factor of this SSD uses a PCIe Gen3 x4 connection and NVMe controller technology which enables read speeds up to 2,150 MB/s, write speeds up to 1,260 MB/s, random 4K reads up to 300,000 IOPS, and random 4K writes up to 100,000 IOPS. If you want to add external storage drives or other peripherals, the Z640 features 8 x USB 3.0 ports, 2 x USB 2.0 ports, and 2 x PS/2 ports. For users who wish to add additional components to the drive bays, the Z640 features two internal 3.5" drive bays and two external 5.25" drive bays. Whether you are listening to music, watching a movie, or playing a game, the integrated Realtek HD ALC221 outputs high definition audio and delivers higher fidelity than standard audio controllers. The Z640 Series P0C92UT Minitower Workstation includes a USB keyboard, a USB mouse, and a power cord. Its 925W power supply operates using 100-240 VAC at 50-60 Hz. While the installed operating system is Windows 7 Professional (64-bit), a Windows 8.1 Professional (64-bit) license is included. Also included is Windows 7 Professional (64-bit) recovery media. B&H Photo is an authorized HP reseller with professional in-house technicians available for upgrades & installations on these workstations and laptops. Built with power and speed in mind, the Z Series is designed to enhance audio and video post-production workflows and more. Each HP Z series workstation or laptop features a range of top-tier processors and large RAM loadouts. The workstations are built with graphics flexibility in mind as well so that the end consumer can configure the graphics options to their needs, and each unit includes a 3/3/3 warranty - 3 years limited warranty for parts, 3 years limited warranty for labor, and 3 years of repairs performed at customer site for those parts not eligible for Customer Self Repair (CSR). For 24/7 customer service, please call 1-800-334-5144. If you own a HP pc workstations and have a user manual in electronic form, you can upload it to this website using the link on the right side of the screen. Box Dimensions (LxWxH) 23.9 x 23.0 x 12.4"
The user manual for the HP Z640 Series P0C92UT Minitower Workstation P0C92UT#ABA can be downloaded in .pdf format if it did not come with your new pc workstations, although the seller is required to supply one. It is also quite common that customers throw out the user manual with the box, or put the CD away somewhere and then can’t find it. That’s why we and other HP users keep a unique electronic library for HP pc workstationss, where you can use our link to download the user manual for the HP Z640 Series P0C92UT Minitower Workstation P0C92UT#ABA. The user manual lists all of the functions of the HP Z640 Series P0C92UT Minitower Workstation P0C92UT#ABA, all the basic and advanced features and tells you how to use the pc workstations. The manual also provides troubleshooting for common problems. Even greater detail is provided by the service manual, which is not typically shipped with the product, but which can often be downloaded from HP service. If you want to help expand our database, you can upload a link to this website to download a user manual or service manual, ideally in .pdf format. These pages are created by you – users of the HP Z640 Series P0C92UT Minitower Workstation P0C92UT#ABA. User manuals are also available on the HP website under Computers & Solutions - Desktops & Workstations - PC Workstations.